Ways to Wear: Squibble & Co. 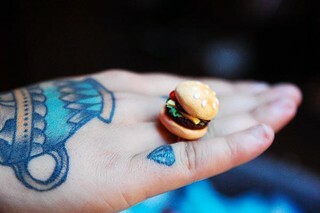 Hamburger Ring! We are right in the middle of winter here in New Zealand, and I am looking forward to spring and warmer weather! You could easily adapt this outfit for winter by adding a thick brightly-coloured scarf and coat, with some snug winter tights. This week’s Polyvore set features the Squibble & Co. 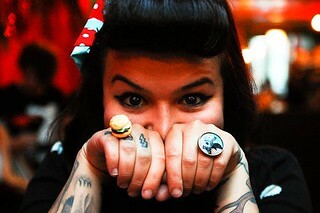 Hamburger ring, as modelled by Twyla at The Might Mighty Market earlier this year! I’m looking forward to the July Mighty Mighty Market, which is on tomorrow from 1pm – 5pm upstairs in the Mighty Mighty Bar at 104 Cuba St, Wellington! Come along and check out new products from Squibble & Co., including hand-made cards and notebooks!